Get ready for the Professional in Human Resources (PHR) and Senior Professional in Human Resources (SPHR) certification exams at your own pace with this unique test product. It's a comprehensive testing engine with more than 600 practice exam questions, which provides ample opportunity to get practice in not only the material, but also in taking the exams. 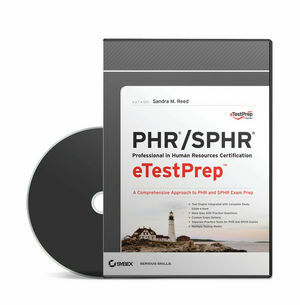 Each exam question contains a link to an electronic version of Sybex's bestselling PHR/SPHR: Professional in Human Resources Certification Study Guide, Fourth Edition, where you can get more information. Be thoroughly prepared for the Professional and Senior Professional in Human Resources certification exams with PHR/SPHR Professional in Human Resources eTestPrep. The license is active for 36 months from time of activation. Sandra M. Reed, PHR, SPHR, has over 17 years of experience in human resources. She is the owner of Epoch Resources, a consulting firm specializing in the unique HR needs of small businesses. Sandra has authored learning modules and case studies for the Society for Human Resource Management.